Sometimes an excellent operating system can be made even better. Apple’s mobile operating system, iOS, is all things to its users offering a plethora of sophisticated applications aimed at making it a one-stop shop for the iPad and iPhone worlds. Whether it be storage (iCloud), music ( iTunes), photography (Photos), documents (Pages and Notes) or any of the other functions its users seek, the system has an app for the job. But despite the excellence of iOS some people find such largesse both confusing and time consuming. There seem to be apps and files and data everywhere and getting your head around it can be difficult – and that’s where the Dearmob iPhone Manager app comes in. This file manager allows the user to not only accesses their files offline but also delivers a functionality that ensures iOS becomes even better by simply making it easier to use. Let’s start with something that can, at times, be a little difficult on iOS – backup and restore. 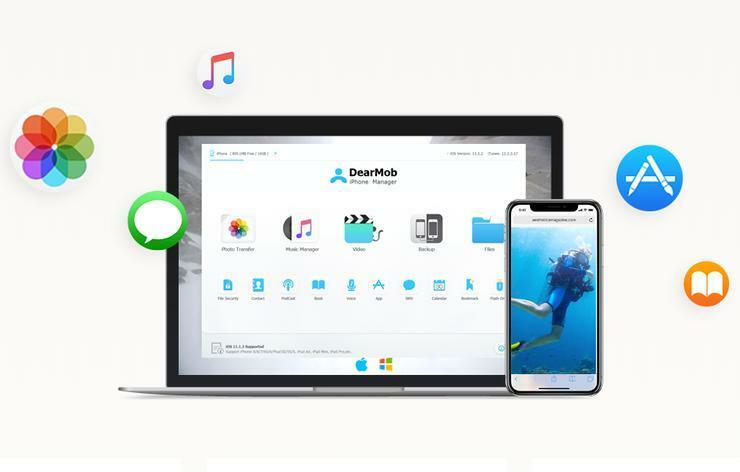 Dearmob iPhone Manager allows you to simply backup and restore your iPhone and iPad data to your own hard drives, regardless of whether you use a PC or a Mac. For iPhone or iPad owners who would rather avoid backing up their devices to iCloud via iTunes, the app offers an easy and speedy alternative to what can sometimes be a slow process. In addition, the free version of Dearmob iPhone Manager is quite light on limitations. It gives you a daily limit on how much data you can transfer using the application but otherwise offers you the same fully-featured experience as the paid version. There are no locked features or time limits. Most importantly, Dearmob iPhone Manager has enhanced security standards. When you copy data from your iPhone or iPad to your PC, it directly overwrites the original data on disk with encryption, instead of creating unencrypted originals that aren't always easy to completely erase. This smart little app relies on multiple encryption algorithms for added security, including 1024-bit RSA, 256-bit AES, PBKDF2 and Argon 2. It also allows for password-protected backups and more specific backup formats, such as pulling all your SMS messages into an easy-to-read PDF file. That’s a nice touch. Like all operating systems, Apple’s iOS ecosystem can also be finicky about formats. Dearmob iPhone Manager has tools that allow you to import, export and convert media to and from your iPhone, whether it be a video, image, app, audio file or eBook. You can transfer music onto your iPad or iPhone without loading it into iTunes and easily convert AAC files to MP3s. The software also supports easy-export and conversion of 4K video on your device and just-as-easy importing and conversion of up to 8K video files to your handheld. And while you are trying to get your head around Apple’s new and smart proprietary HEIC format - that replaces a long-time term servant of photography, the JPEG - you can easily convert your photos back to the more familiar format. Dearmob iPhone Manager also opens up other new possibilities for your iPad and iPhone by allowing you to install Apps that are not in the App Store without going so far as to jailbreak your device, although we recommend caution when doing so. The Dearmob iPhone Manager gives iPhone and iPad owners across both Windows and Mac ecosystems a new found ease of use and extended functionality. And that has to be a very good thing. Users who want to get started with DearMob iPhone Manager can get a free copy of the program via the official giveaway.